The Canadian Association of Crown Counsel (CACC) is the national association which represents the collective interests of Crown prosecutors and Crown lawyers. Meetings are held bi-annually. On behalf of the BC Crown Counsel Association, directors Jennifer Lopes, Mike Fortino, and I attended the fall meetings in Fredericton NB. There were representatives from all provinces but for PEI, as well as, a representative from the Federal Department of Justice. On the first day Rick Woodburn, CACC President, welcomed and reminded us what the CACC has done in the past which included having a voice in the drafting of Federal legislation and policy making (such as the Victim Rights Bill); being invited by the Standing Senate Committee on Legal and Constitutional Affairs to lend our voice on delays in Canada’s criminal justice system; invited to attend the Heads of Prosecution meeting; lending support to international Crown/Civil associations; and assisting all of the provincial Crown/Civil associations. Other agenda items on the first day included (i) a report by our own member, Wendy Stephen, of the goings on of the International Association of Prosecutors; (ii) the continuation of a CACC representative attending the National Joint Committee of Senior Criminal Justice Officials (NJC) bi-annual meetings; (iii)a discussion on Quebec’s new Code of Ethics and what effect it has on Quebec prosecutors; (iv) a discussion regarding pensions and the various provincial and federal government positions; (v) and a presentation by the New Brunswick Crown Counsel involved in the Oland prosecution. The second day began with The Attorney General for New Brunswick welcoming all of us to Fredericton and thanking us for the important role we play in the justice system across Canada. The remainder of the morning included discussion about CACC’s (i) website; (ii) financial report; and (iii) governance. The afternoon consisted of each representative providing a report of the goings on of their association. What came across loud and clear is that we all have workload issues and bargaining is never easy. I can also say that our current contract is looked at by other associations as the model to strive for with our compensation being linked to the provincial court judges and the grievance mechanism that we have in place. There are other association contracts such as Ontario, Manitoba, and Nova Scotia that are also very appealing as they have binding arbitration if bargaining collapses; as opposed to our contract that has the right to strike. 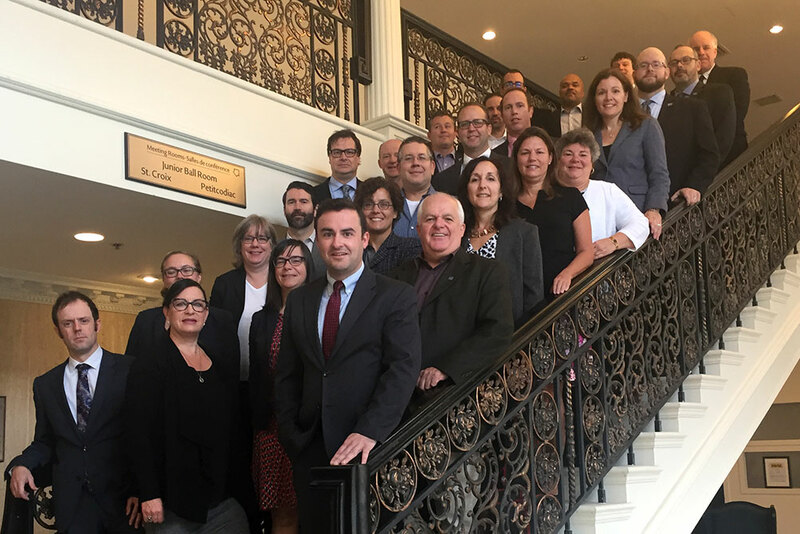 These meetings are very informative, giving us the opportunity to find out firsthand what is happening to Crown prosecutors and Crown lawyers across Canada; and learning how we can make our own association stronger.